I'm a bit under the weather at the moment which is kind of inconvenient with just a few days to go until the Furry Nice class starts! I did manage to take a quick photo yesterday of the Polar Bear that is the star of the class. I think he turned out rather sweet but I am tempted to add a whole lot more flowers to the border. 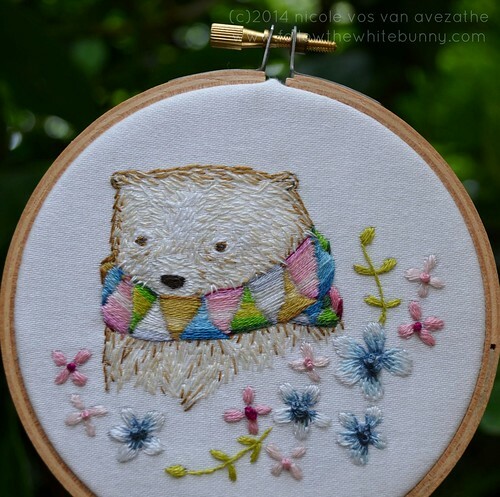 Maybe later though because I already have another furry character in the hoop at the moment, at the request of a fellow embroidery designer! Ach, hij ziet er ook echt een beetje verkouden uit... Mooi getroffen! Wow!!! It's wonderful!!! Great work!